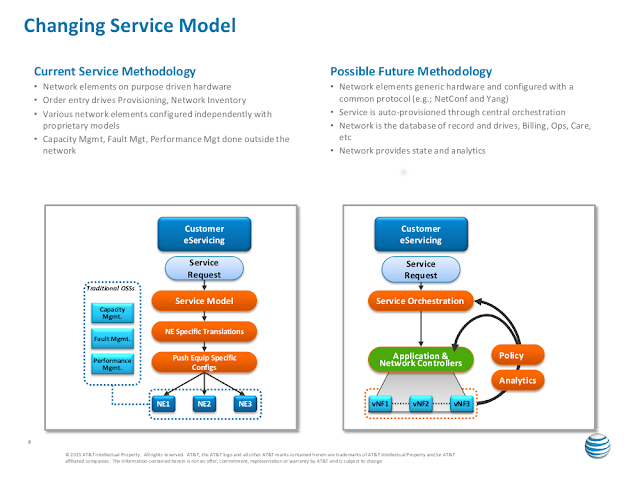 Recent presentations from AT&T and Google describe SDN/NFV architectures that incorporate measurement based feedback in order to improve performance and reliability. The first slide is from a presentation by AT&T's Margaret Chiosi; SDN+NFV Next Steps in the Journey, NFV World Congress 2015. The future architecture envisions generic (white box) hardware providing a stream of analytics which are compared to policies and used to drive actions to assure service levels. The second slide is from the presentation by Google's Bikash Koley at the Silicon Valley Software Defined Networking Group Meetup. In this architecture, "network state changes observed by analyzing comprehensive time-series data stream." Telemetry is used to verify that the network is behaving as intended, identifying policy violations so that the management and control planes can apply corrective actions. Again, the software defined network is built from commodity white box switches. Support for standard sFlow measurements is almost universally available in commodity switch hardware. sFlow agents embedded within network devices continuously stream measurements to the SDN controller, supplying the analytics component with the comprehensive, scaleable, real-time visibility needed for effective control. 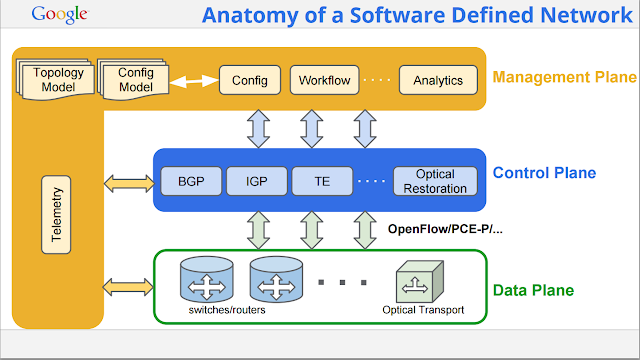 While the incorporation of telemetry / analytics in SDN architectures is recent, the sFlow measurement standard is a proven technology that has been incorporated in switch ASICs for over a decade. Incorporating sFlow in SDN solution stacks leverages the capabilities of commodity switches to provide immediate visibility into operational networks without the complexity and cost of adding probes or being locked in to vendor specific hardware.